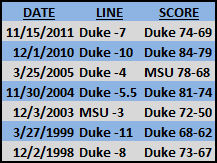 For as much as Tom Izzo yearns to turn the Michigan State into a Duke-like program the Spartans' master has been really bad in head-to-head matchups against the Blue Devils and Coach K.
The teams have met seven times during Izzo's tenure and the Spartans are just 1-6 in those games. To be fair, Duke has had the better team every time the teams have met and only once were the Spartans favored to win a game. 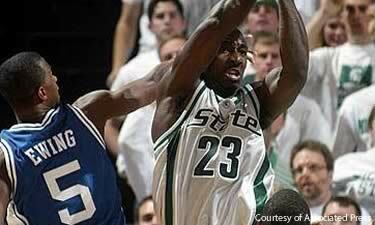 (MSU was a 3-point favorite at home in 2003 but lost by 22). The silver lining for the Spartans is that Izzo is 1-1 against Coach K in the NCAA Tournament. Duke won the 1999 Final Four matchup en route to a title-game loss to UConn while the Spartans were victorious in the 2005 Sweet 16 en route to a Final Four appearance. While "real life" wins and losses haven't been plentiful, Vegas thinks the Spartans have been great in the MSU-Duke matchups. The Spartans are 5-2 ATS. In fact, the underdog has covered in all but one meeting in the seven-game series. Analysis: This game should be close if both of the following happen: First, Michigan State exerts its will in the post, punishing Ryan Kelly and Mason Plumlee with a heavy dose of Derrick Nix and Adreian Payne; Second, Duke uses its superior shooting advantage from 3-point range. 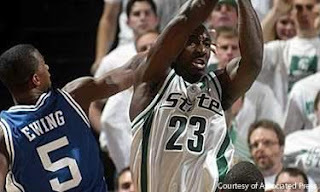 Of all the MSU-Duke matchups over the years this one seems to be the biggest "toss-up" on paper. It would surprise me (or the world) to see either team win. It also wouldn't surprise me to see either team win by double digits because if one team struggles where it has the advantage (ex: MSU misses a dozen-plus layups and putbacks or Duke finishes something like 5-for-27 from 3-point range) then things could get fairly ugly. I expect both teams to have rough patches but, for the most part, play as they have all season. When it comes to the NCAA Tournament it seems teams that have been more physical have been able to win. It's why I see the Spartans not only covering but winning outright. Call it Michigan State 66-64.